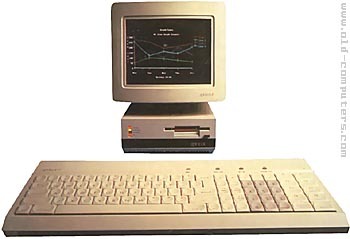 The Apricot F1 was however originally shipped with a plastic light-pipe that could be connected between the keyboard and CPU so that obstacles would not block the signal. Another drawback was that the keyboard had to be constantly powered with batteries! Just above the quite comprehensive membrane keyboard are four small round buttons used to set the date and time of the internal clock, to change the rate of the keys auto-repeat feature, to lock the keyboard and to reset the computer. Even if the F1 used an 8086 it wasn�t really IBM PC compatible (though minor changes could make it BIOS compatible). The MS-DOS 2.11 used by the system is an Apricot modified version of the "real" MS-DOS. The Apricot F1 was delivered with a nice icon-based graphical interface called "Activity" along with quality bundled sotfware for graphics, communication, wordprocessing and system tools. The same infra-red mouseball pointing device used with the Apricot Portable was available for the F1. As the F1 was not IBM PC compatible and not particularly cheap, it didn't have great success outside its native country (UK). A slightly less expensive version was also released, labelled F1e. It was the same machine but the 720 KB floppy drive was replaced by a single sided 320 KB version. This version was about 300 Euros cheaper than the normal version. see more ACT Apricot F1 Ebay auctions !